Few conditions cause as much suffering on a personal and societal level as addictions. There have been considerable advances in elucidating the psychological and neurobiological mechanisms underlying addiction, but these insights have not translated into treatment innovations. Mindfulness training, a method of self-observation based on ancient Buddhist psychological models of human suffering, has recently shown promise in the treatment of addictions. Remarkably, the early Buddhist models might be able to further inform our current understanding of addiction and offer novel treatments that outperform traditional options. 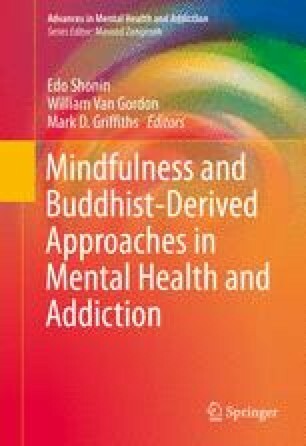 While Buddhist meditations were not originally designed to specifically treat substance dependencies, Buddhist psychological models show considerable overlap with the current models of addiction, and Buddhist practices aim explicitly to eliminate the causes of craving. In this chapter, we will describe the overlap and similarities between early and contemporary models of the addictive process, review studies of mindfulness training for addictions and their mechanistic effects on the relationship between craving and behavior, and discuss recent neuroimaging studies that help to inform our understanding of the neural mechanisms underlying mindfulness.